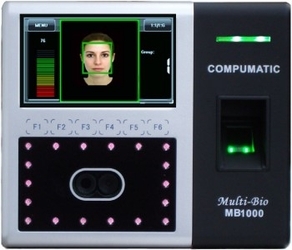 Complete Package Includes MB1000 face recognition & fingerprint terminal, CompuTime101 software, 5' Ethernet cable, wall mounting bracket, hardware, instructions, and AC power supply. 1 year software support agreement includes unlimited phone and e-mail support. Install the CompuTime101 software on multiple computers and share the data. Setup multiple user names and passwords to track which user made punch corrections. Assign user rights to restrict access to features such as wages or punch editing. Collect a user entered code at the terminal. You define the codes, ranging from 1-9 digits (8 digits max with the HandPunch clock). Codes can be used to track departments, jobs, etc... Detail and summary reports are available and can be filtered by code number.